Takuro Someya Contemporary Art is pleased to announce the opening of the sculptor, Motomasa Suzuki’s solo exhibition. The first in four years, this will be the artist’s third solo exhibition at our gallery. We’d like to welcome you all back on this occasion to see the frontier of Suzuki’s wood carving. Suzuki, born in 1981, graduated from the Department of Sculpture at the Musashino Art University in 2004. He possesses a unique sense of scale that transcends into his wood sculptures, and his unique way of exhibiting those works has similarly attracted much attention in recent years. Suzuki is profoundly influenced by the American movies he’s been watching since childhood and lets that visual sense flow freely into his works. He possesses a unique sense of scale, however, his works differ vastly from that of a diorama or miniature models. Instead, he uses one small shot of a scenery as a starting point, linking the “wall →roof→window” in order to build the small worlds. As an experiment, we shall name this new concept “Scene Sculpture”. Accompanied by the changes in the sense of distance and perspective from the camera position, the structure of the scene sculpture incorporates a movie-like reduction/enlargement scale to zoom in and out, as well as a camera-inherent optical distortion. Typically, in the world we see, there is a viewpoint, from which distance or optical distortion is incorporated and that gives birth to the sense of scale from a contrasting relationship with the human body so that, the landscape changes significantly according to the changes in viewpoint. Suzuki’s scene sculpture, however, differs from that. It doesn’t regard the viewers closing the distance to the work it faces. Instead, it nestles there quietly as wood sculpture, and you can even look closely to see the details of the carved lines. This means that even though the optical distortion of the landscape is incorporated in the structure, the landscape does not change by the position we view from, and that gives you a peculiar sense of scale. Scene sculpture is Suzuki’s own unique style showing the unity of sculpture and image, and it is decisively different from the view of a homogeneous scale model. 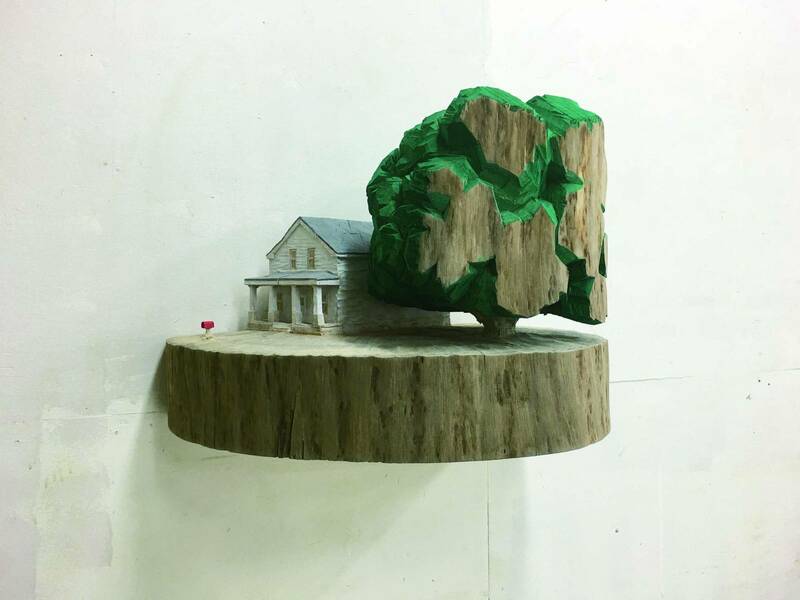 Moreover, his sculptures are colored with acrylic paint, which is also a point of consciously connecting with the image. Especially in his recent works, he adroitly uses coloring to emphasize the light and dark, and this successfully embodies the image of the light by the sharpness of the sculptures. In the current exhibition, Suzuki’s scene sculptures have been brushed up even more. We will present his newest wall-hung sculptures along with his larger lightbox works developed from the images of his sculptures. In the wall-hung sculptures, he attempts to narrow/focus the viewer’s perspective yet also making his sense of scale even more vivid. In terms of the photo works, he turns his sculptures into the subject, producing the imaginary scenes. Through capturing the images of his works, Suzuki makes the scales of the world that appear in his lenses free to be operated and by making it duplicable, he frees himself from the image of the scenes in his memory. In this exhibition, visitors will be able to see Suzuki’s sculptures that are even more developed. These are works that sway between image and sculpture, a new contemporary art form, created precisely because the world of cinema infiltrated into the artist’s sensibility.